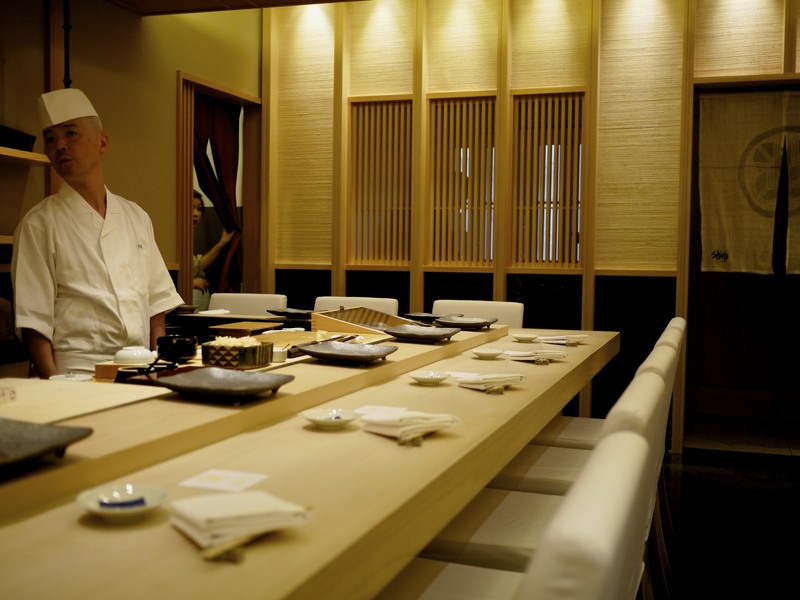 Unlike many overseas sushi restaurants that have been opened up by successful chefs from Tokyo, Minamishima is headed up by chef Koichi Minamishima who spent his formative years at Kenzan, Melbourne. This was a sticking point for me as Kenzan had not impressed me in the past. More importantly it wasn’t known for sushi. 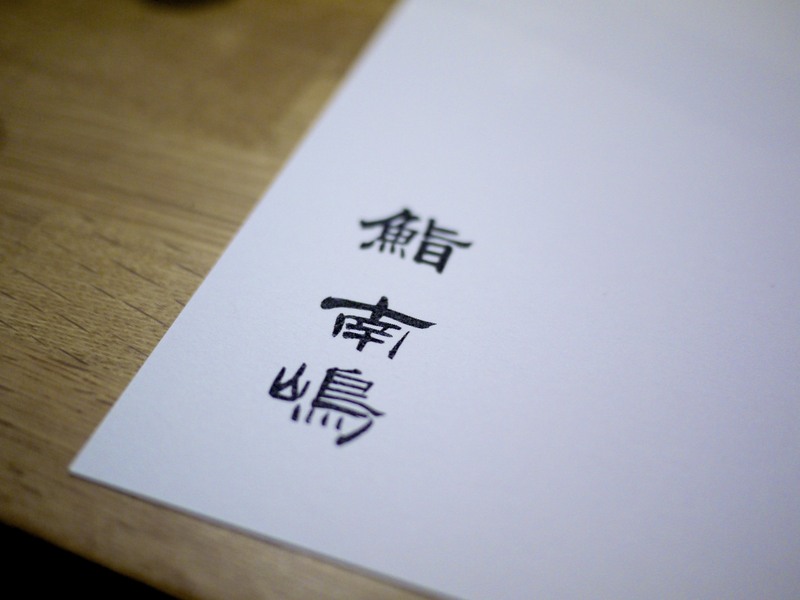 However, I had heard good things so I decided to keep an open mind. There’s only one menu at Minamishima which both makes it easy for the undecided and ensures the best seasonal fish is utilised for all customers. 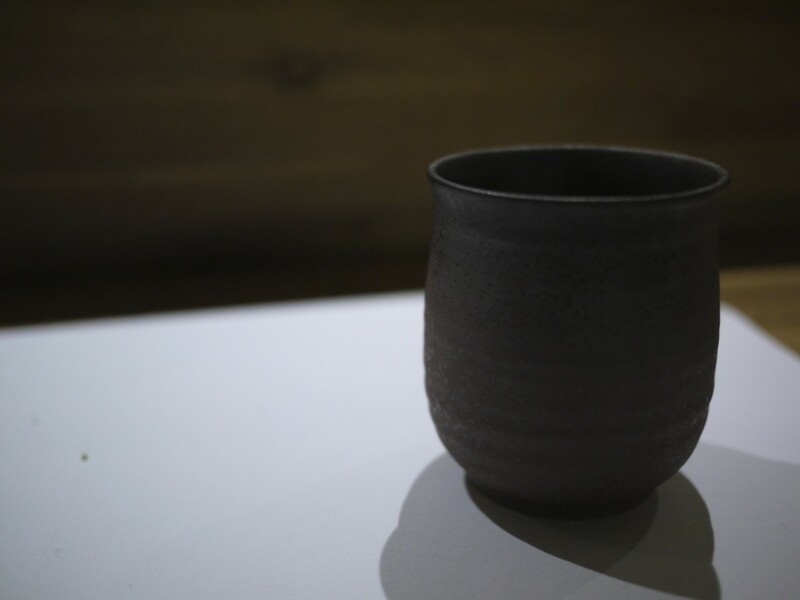 AUD $150 buys you a 15 course meal which can be complimented with matching sake or wine. 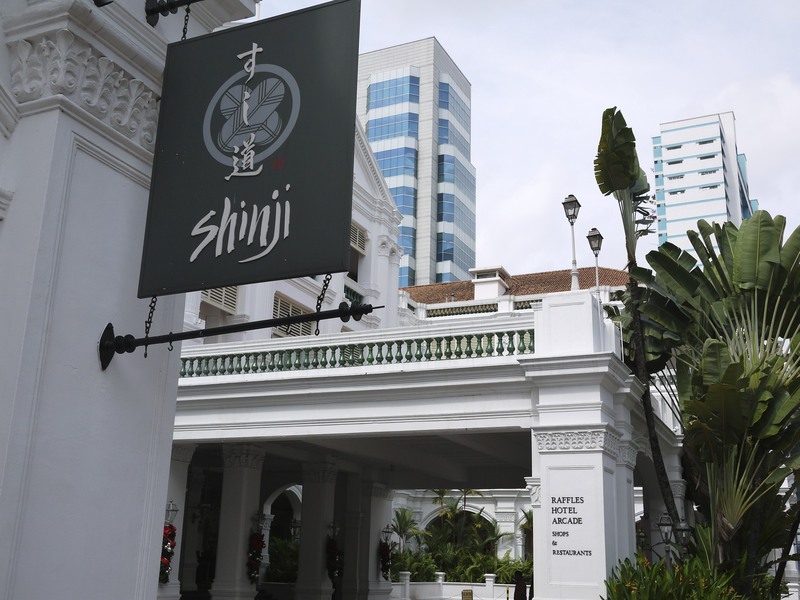 There were also three additional courses offered that evening, two starters and a dessert, for an additional cost…..which cumulatively matched the price of the 15 course menu. 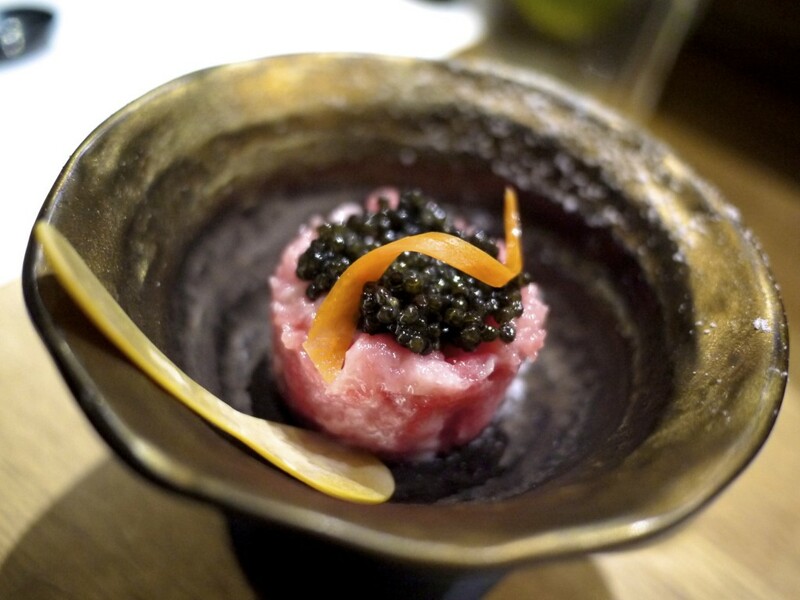 1st Course – Ootoro with Italian beluga black caviar (supplementary course at extra cost): It wasn’t cheap but was definitely worth every cent. 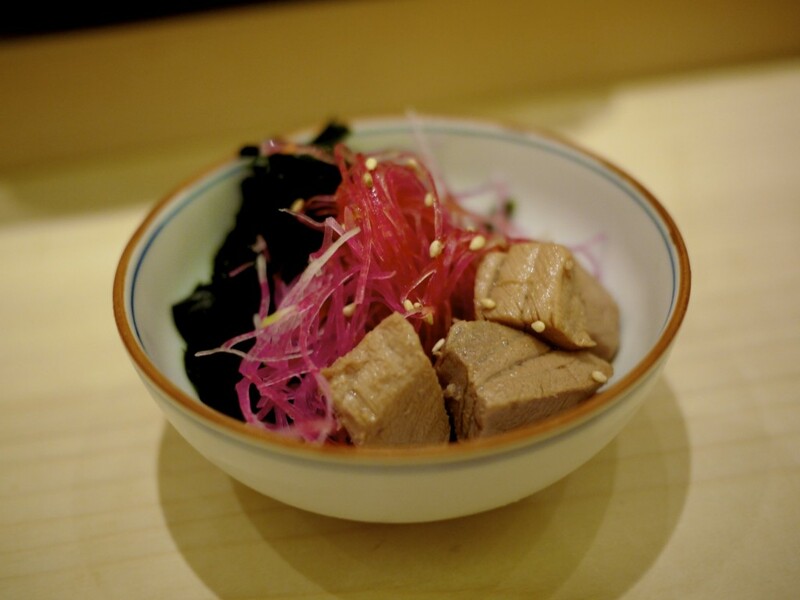 The tuna was sourced that same week from Tsukiji market in Tokyo. 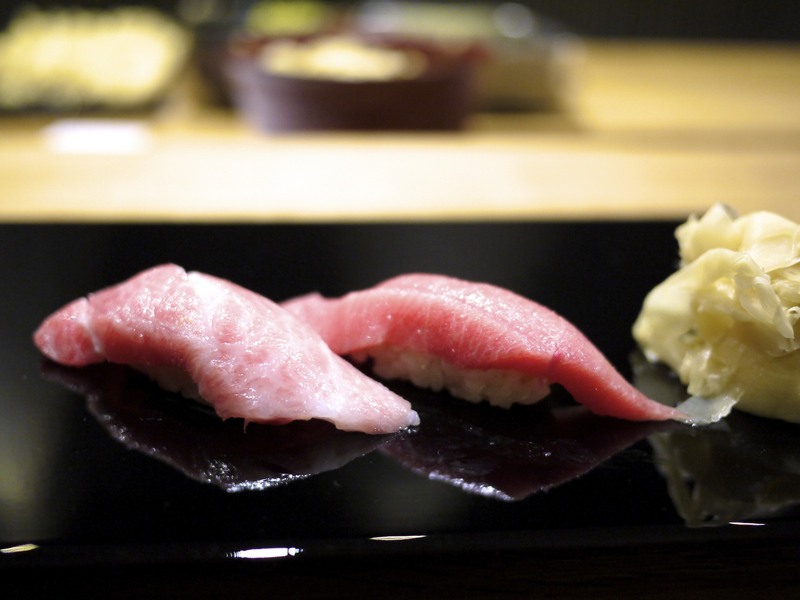 The fatty ootoro (tuna belly) and the salty black caviar went ever so well together. The mother pearl shell spoon was obviously a must when eating black caviar for the purists. 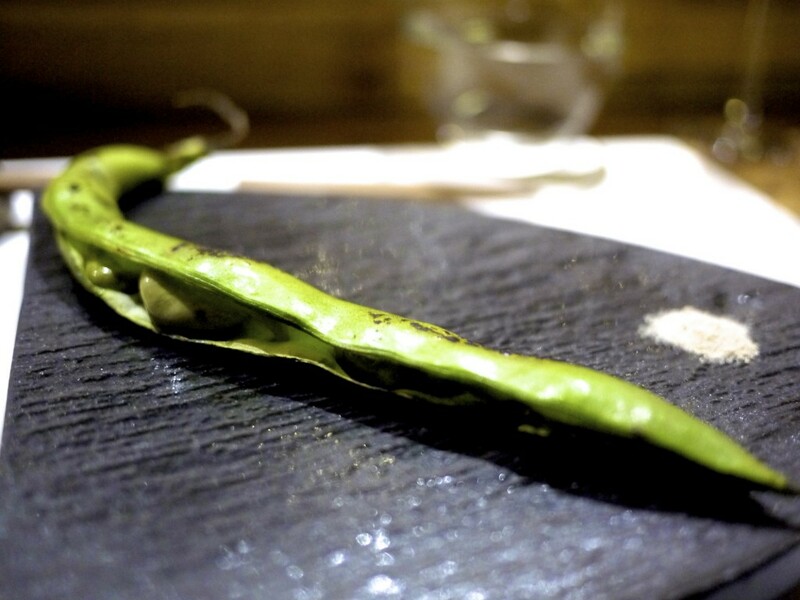 2nd Course – Grilled broad beans with shiitake salt: Not too dissimilar to edamame and I liked the earthy salt in combination with the beans. 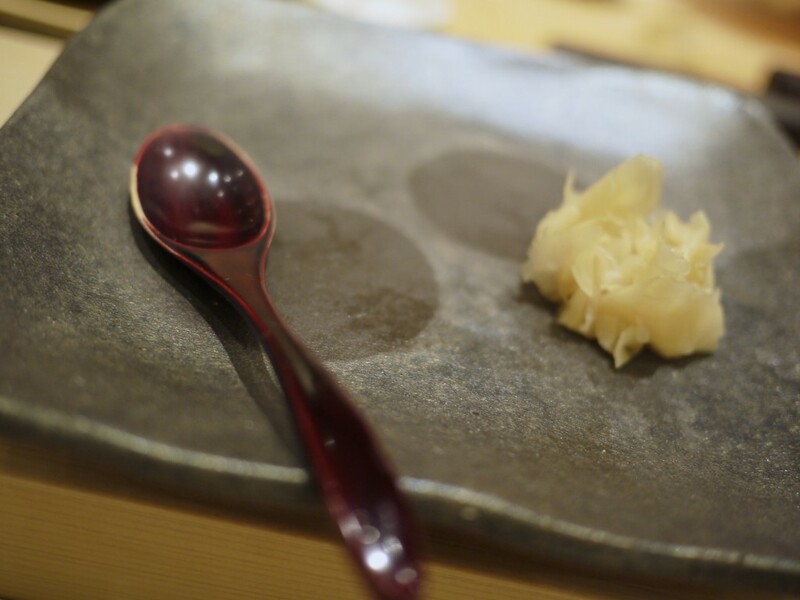 3rd Course – Fugu tempura (Supplementary course at extra cost): Minamishima-san explained that the fugu had been professionally prepared in Japan by a qualified professional before it was delivered to him in Melbourne. 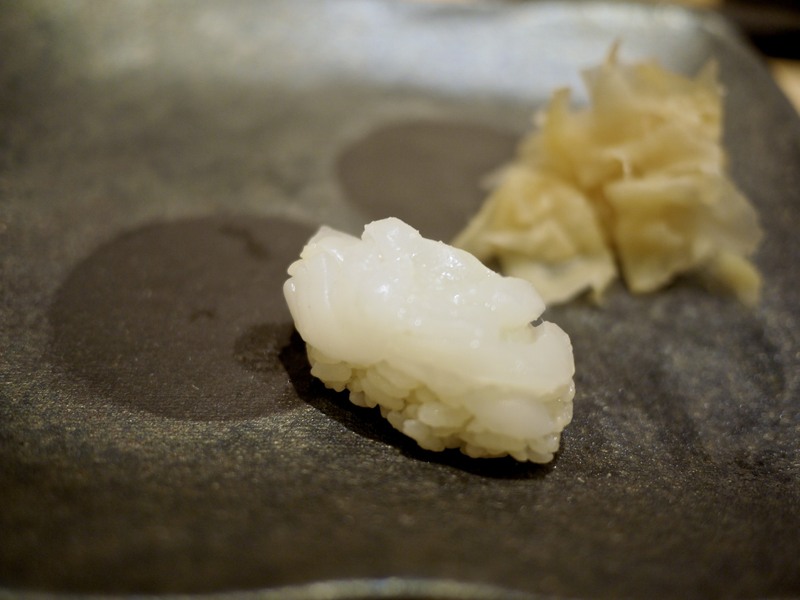 Much like most fugu’s I’ve previously tried, the flavour was very subtle and delicate. 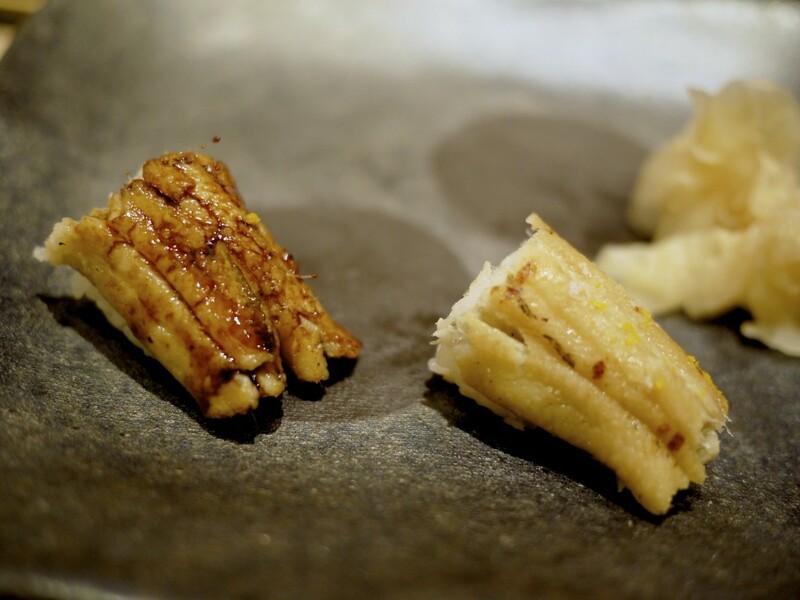 The tempura was surprisingly of good quality, not oily and quite crispy. 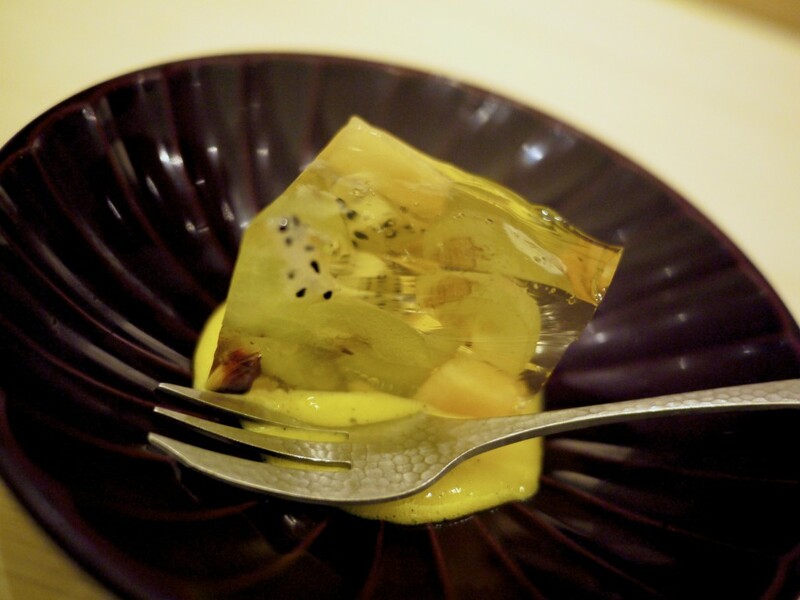 4th Course – King Dory: Cured king dory, a native fish only found in the southern Australian coast, New Zealand and South Africa with no Japanese name. A pinch of sesame and a squirt of lime blew some life into this thin slice of white meat. 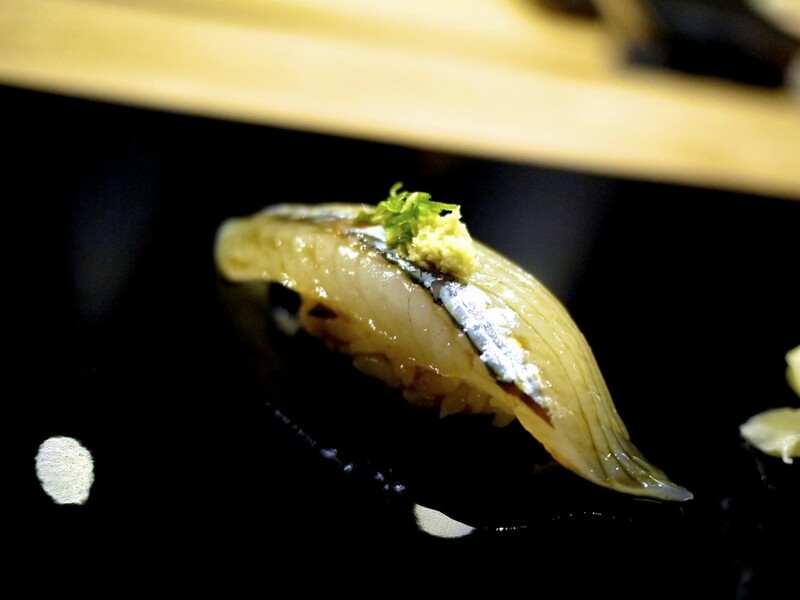 5th Course – Garfish / Sayori (サヨリ): Topped with thinly chopped spring onion and ginger, and some shiso hiding underneath the fish. 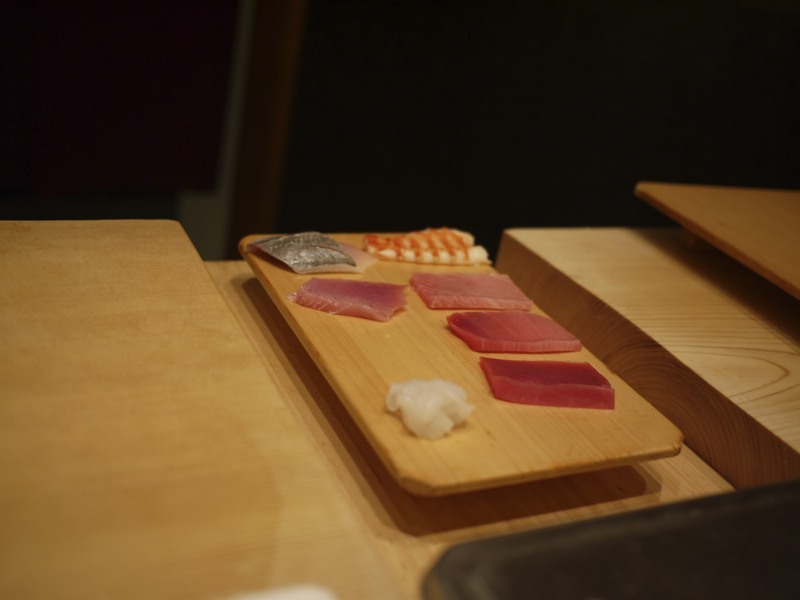 The fish had been dressed with Minamishima’s home made soy sauce. Another delicate fish with a jelly like texture. 6th Course – Cod fish / Tara (鱈): Topped with shiso. 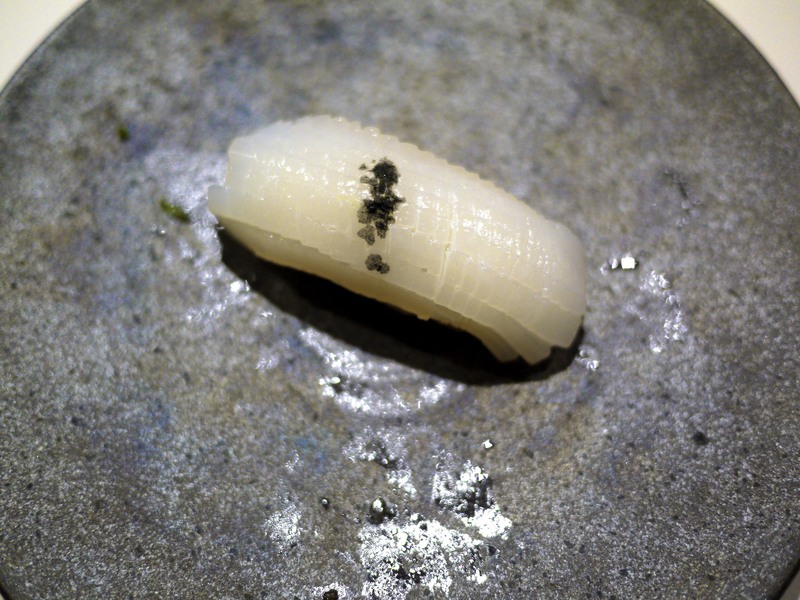 My least favourite nigiri of the evening with unfortunately very little flavour. 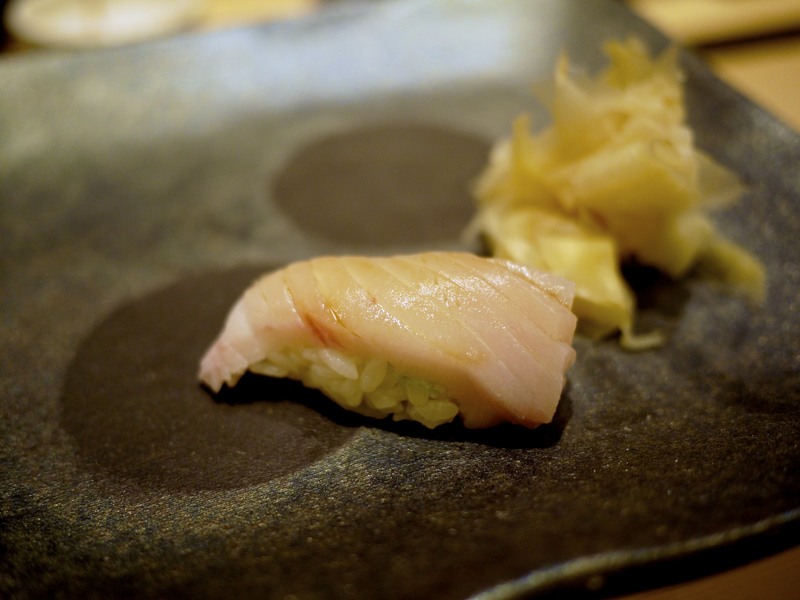 7th Course – Sea Perch / Suzuki (鱸): Finally on to a decent piece of sushi. This was what I was hoping to encounter! Great meaty texture and fattiness. 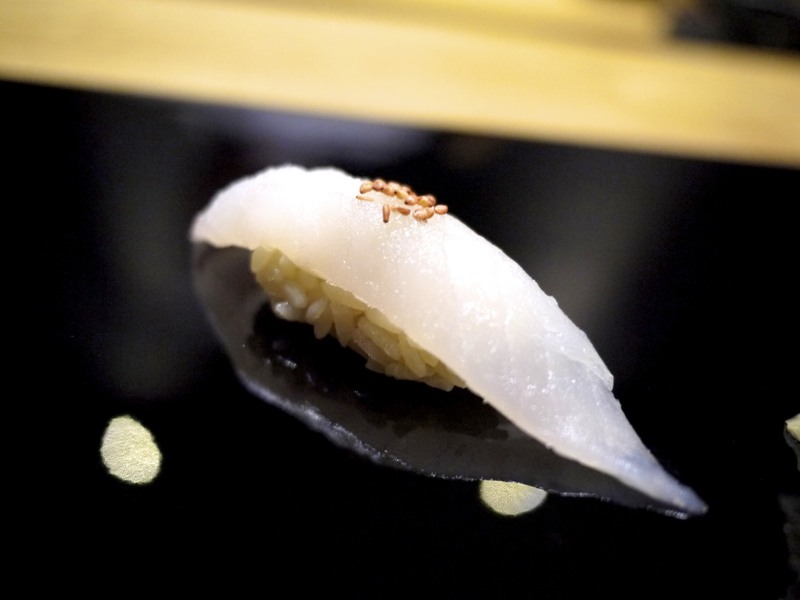 The classic combination of ponzu and grated daikon (Japanese radish) with the sea perch worked well. Here’s to hoping there were plenty more like this ahead! 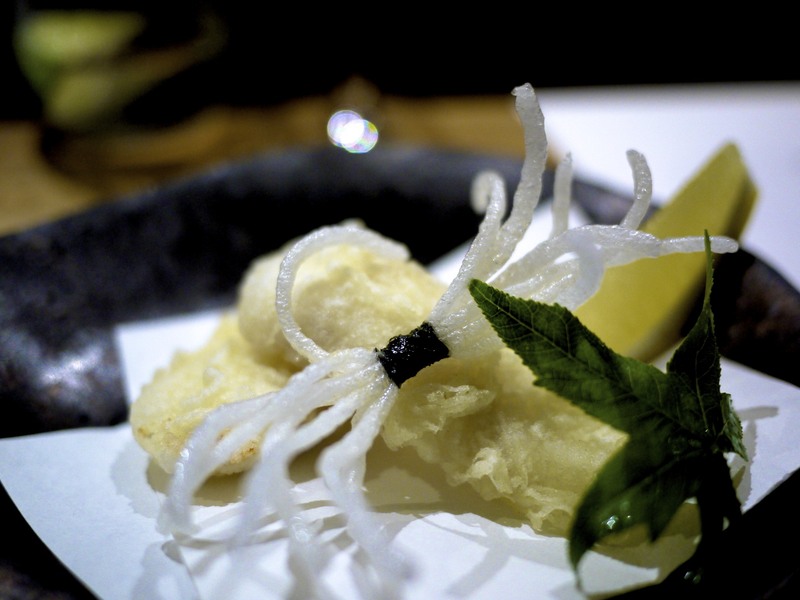 9th Course – Calamari / Aori Ika (アオリイカ): Served with sea salt and shiso leaves. 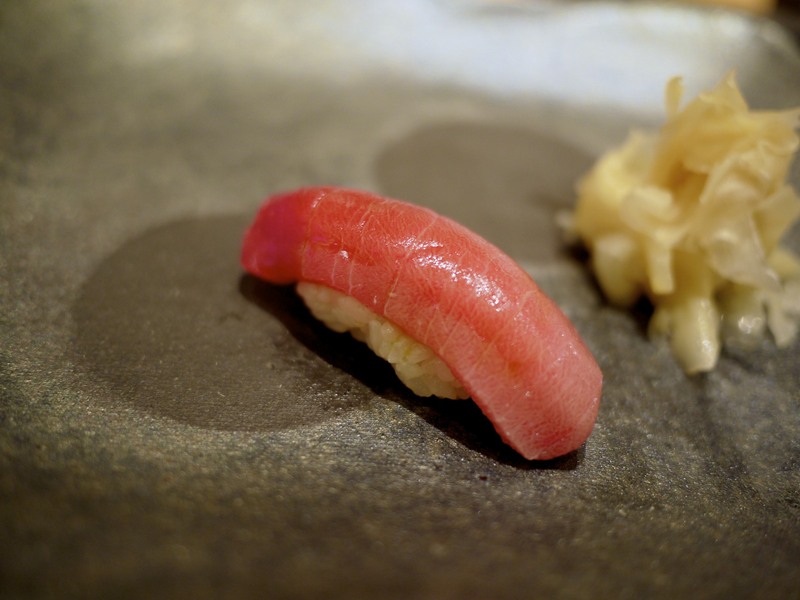 A decent nigiri but not the best calamari I’ve had by a long shot. It had a beautiful creamy texture but I found the flavour rather bland. 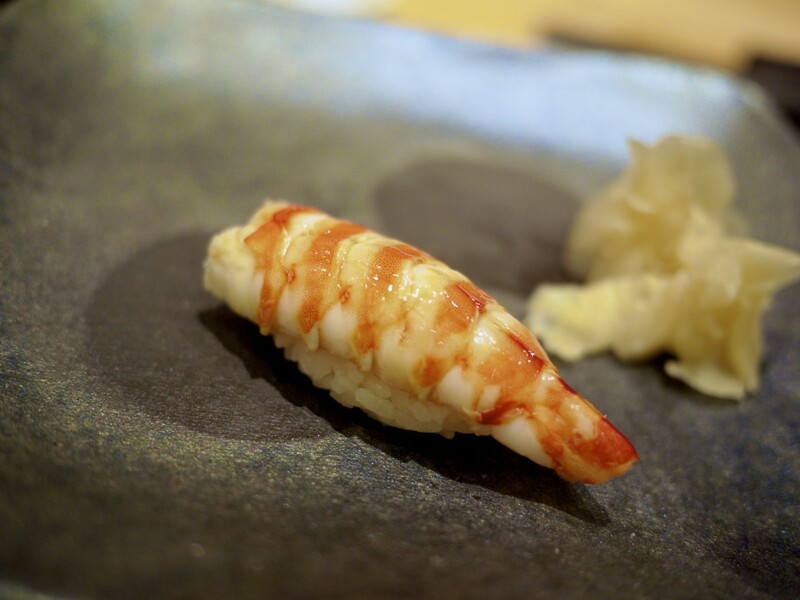 10th Course – Scampi / Tenaga Ebi (手長蝦): The scampi was sourced from New Zealand and was sweet, juicy and slightly crunchy. 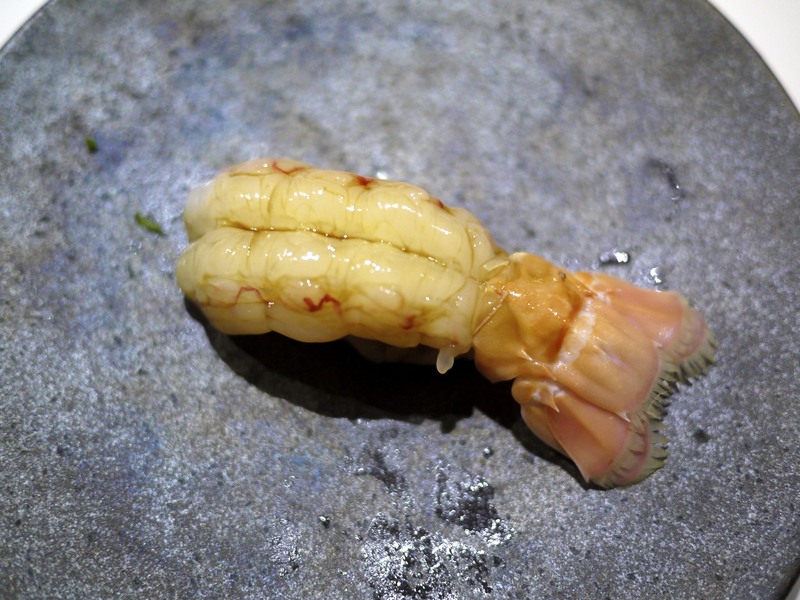 However, it’s definitely no contender to the classic superior choice of the kuruma-ebi which has a far more inviting aroma. 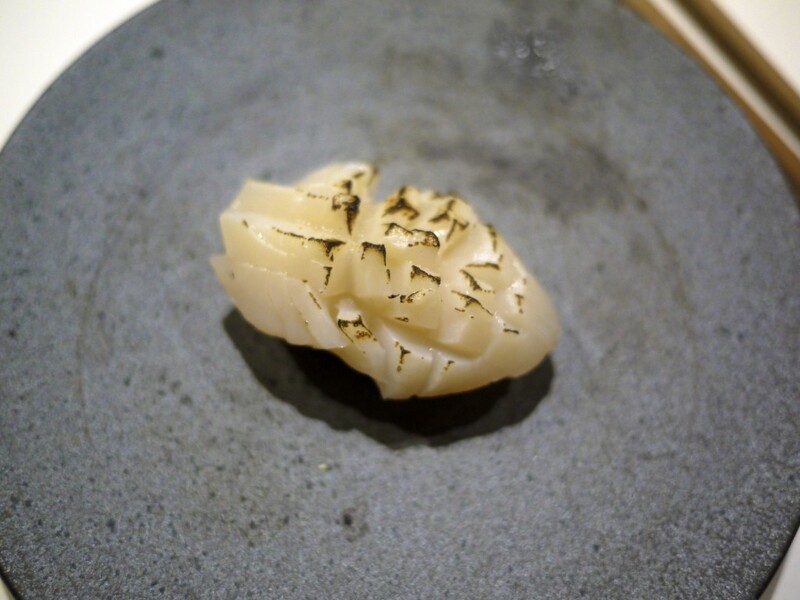 11th Course – Scallop / Hotate (帆立): The scallop, sourced from Hokkaido was, in my view, not treated with respect. The charring left a slight burnt aftertaste and ruined the soft and creamy texture that scallops are renown for. I did however like the smoky component and think this dish could be refined to a lighter degree of charring to make it perfect. 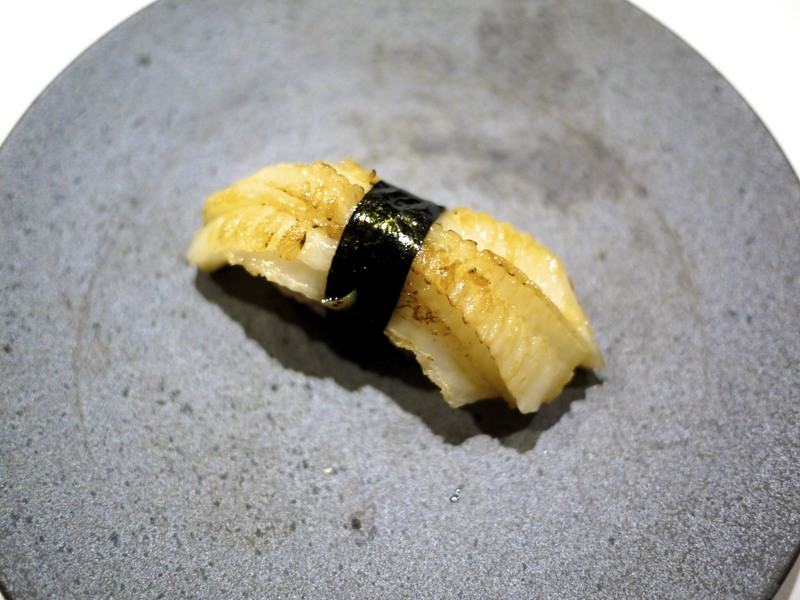 12th Course – Flounder / Karei (カレイ): Finally what I was waiting for. Something to blow me away! 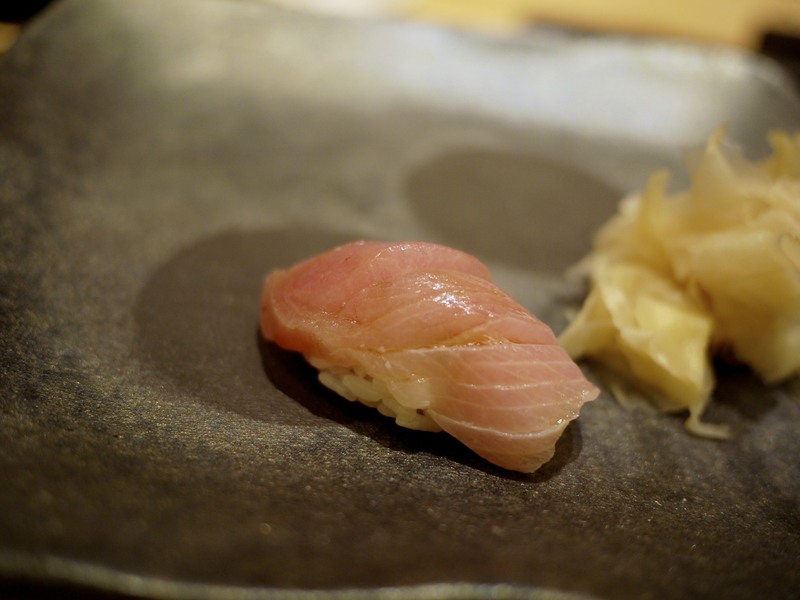 This was definitely my favourite dish of the entire evening and my god what a nigiri that was! The chef utilised the fin of the flounder from Hokkaido which is normally discarded. He then proceeded by intricately scoring it, lightly searing with a blowtorch and wrapping it with nori. The smell was ever so inviting and looked delicately beautiful. It packed a punch of rich, smoky, oily flavour, and a meltingly soft texture from the natural fat of the fish. 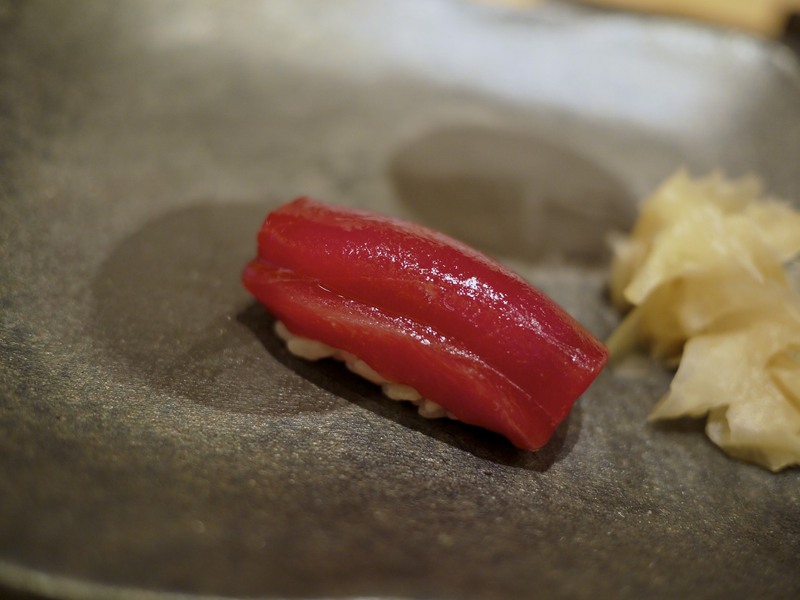 13th and 14th Course – Chutoro (中とろ) and Otoro (大とろ): The blue fin tuna (hon-maguro) was sourced again from Tsukiji. 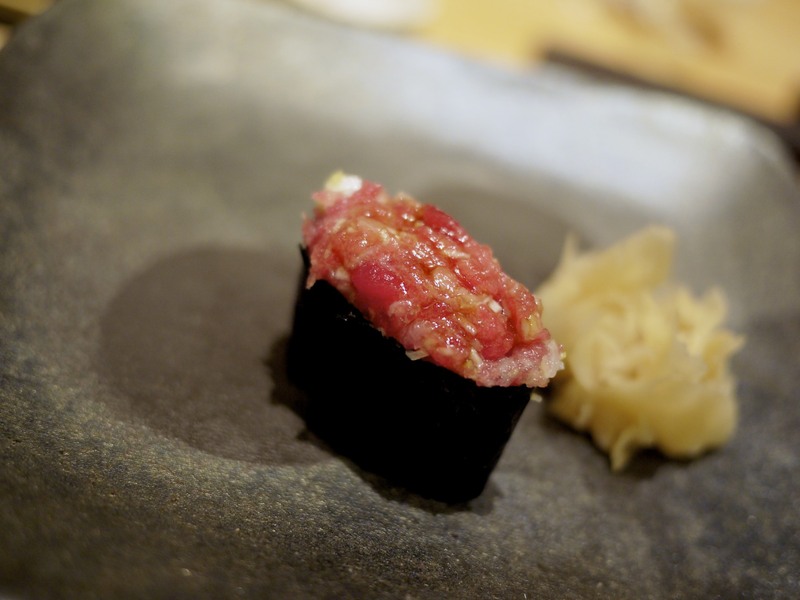 The quality was decent but I was amazed to find quite a bit of sinew in the ootoro. This was a cardinal sin and disappointing. 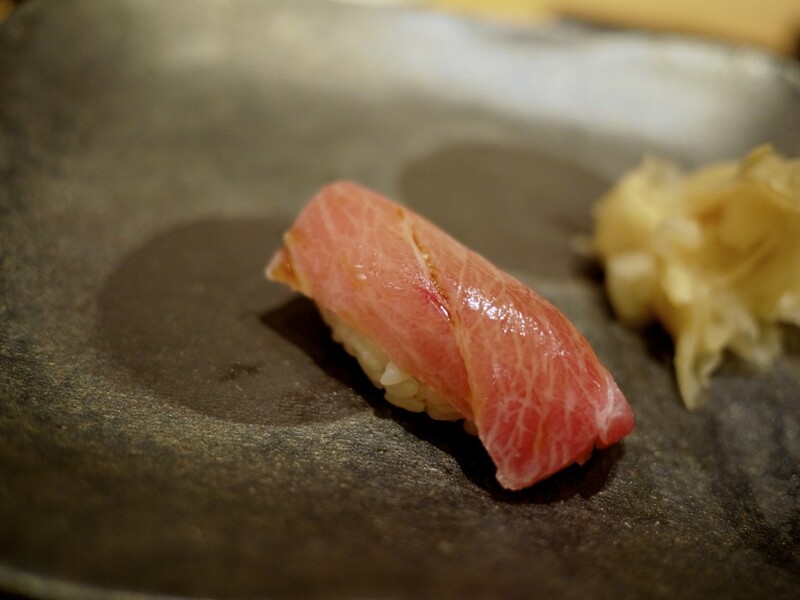 The chutoro was, however, delightful. 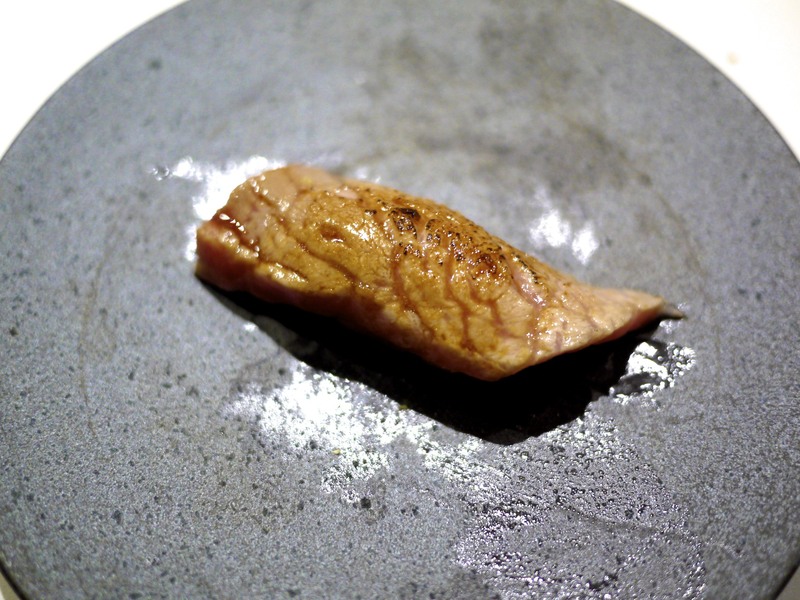 15th Course – Seared Ootoro / Aburi Ootoro (炙り大とろ): Whilst I would normally prefer my ootoro untouched and served as it is, this was far more enjoyable than the previous course as any remaining sinew fortunately had melted to create a juicy and fatty slice of ootoro. 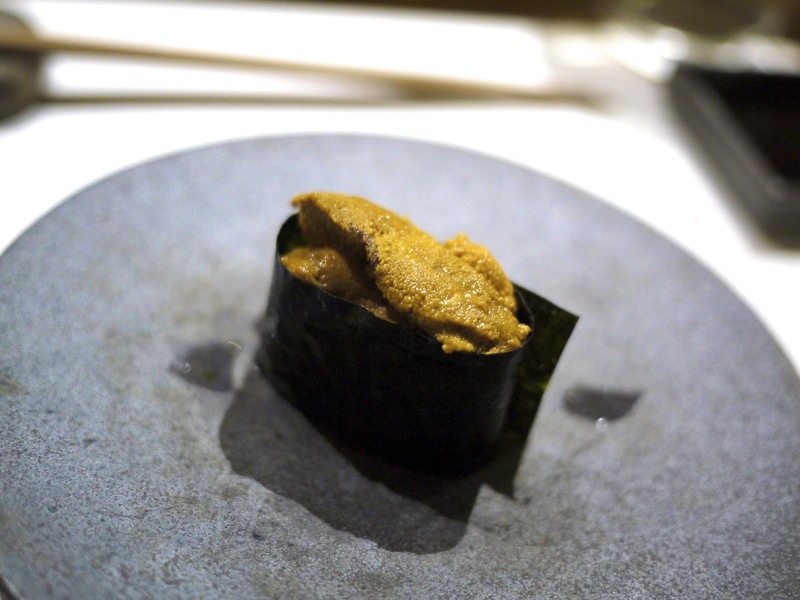 16th Course – Sea Urchin / Uni (ウニ): Sea urchin sourced from Tasmania. 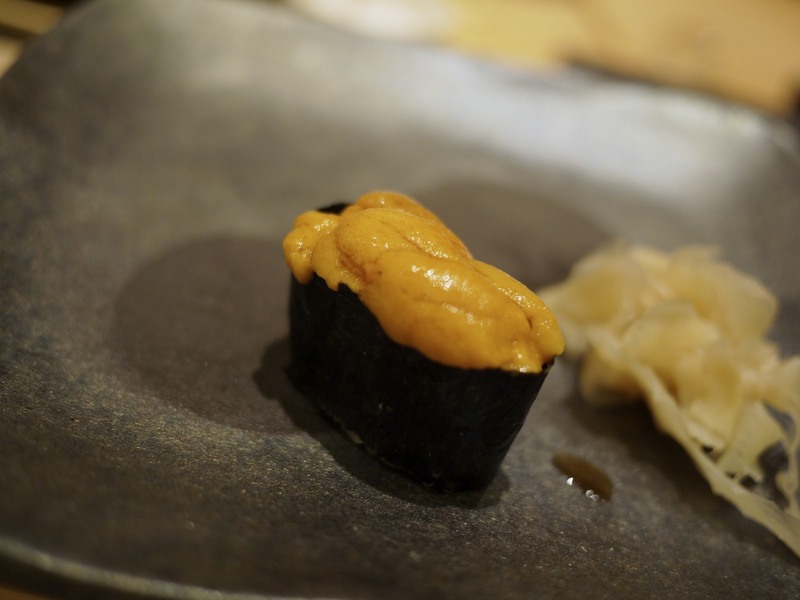 Lovely creaminess and absent of myoban and its bitter aftertaste, which is typically used to preserve the freshness of uni for those that are imported from overseas like Hokkaido. The flavour however was not as bold and distinct as the fresh ones you get in Japan. 17th Course – Mackerel pressed sushi / Saba Oshizushi (さばの押し寿司): Also known as battera (バッテラ), this is one of my all time favourite sushi that I always order if available. 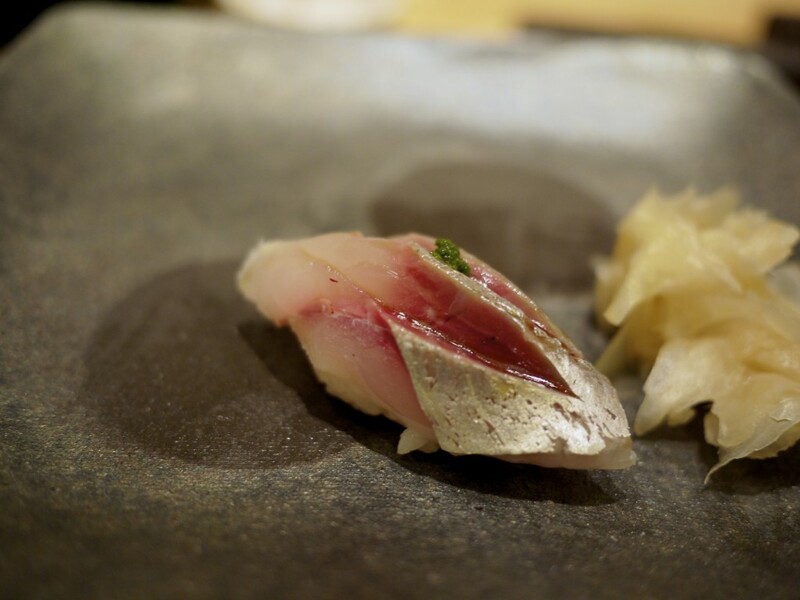 The mackerel was cured well allowing the meat to retain its shape. 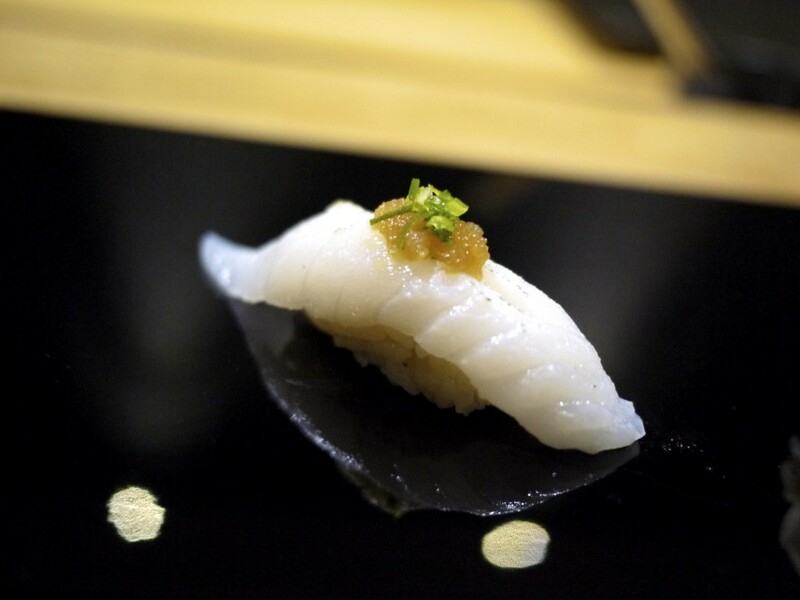 The rice was infused with the lovely oily flavour of the fish and balanced against the sharpness of the vinegar from the curing process. 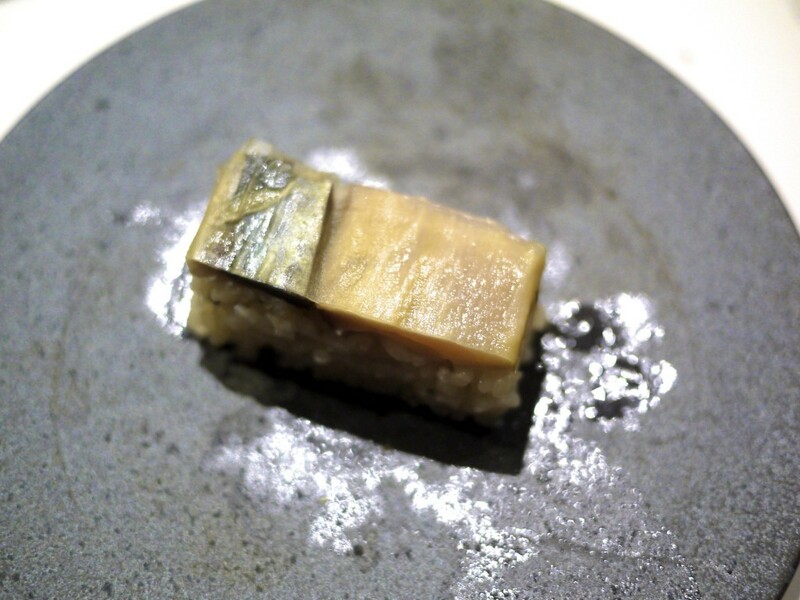 18th Course – Salt Water Eel / Anago (穴子): The final dish of the set menu was another pressed sushi of eel. As noted in my previous write up, there’s a lot of skill required to preparing eel that takes years of practice and experience. I found the kabayaki sauce on the lighter side compared to the usual sticky rich sauce you get in Japan. 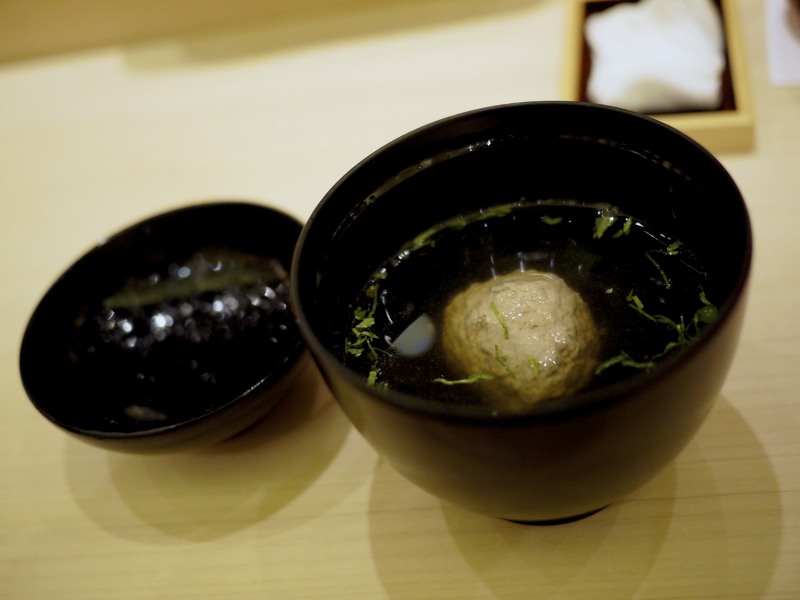 In addition, the flavour of the eel was bland. As we pondered on what additional nigiri’s we were going to order, Chef Minamishima’s right hand man Hajime Horiguchi (middle above) joined the chefs to keep up with the order that were piling in. 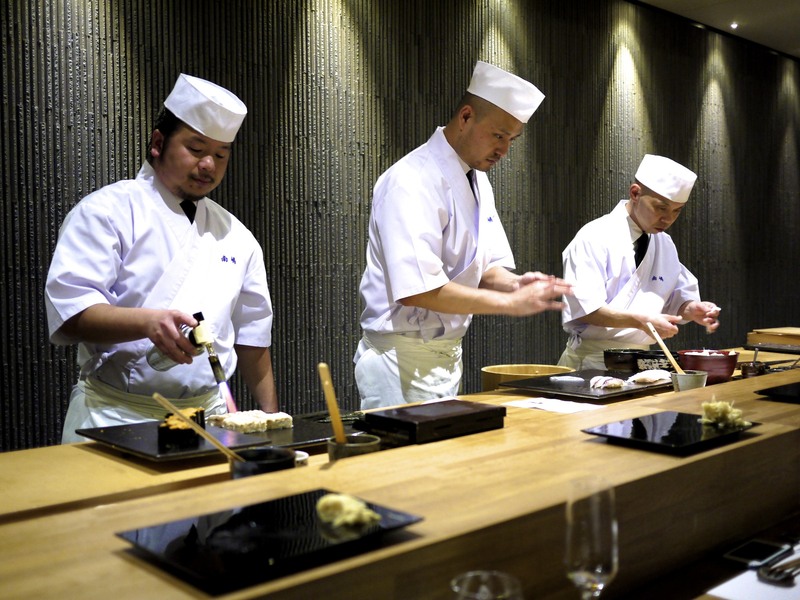 They worked meticulously in sync and the speed at which the sushi’s were being sent out to the bigger tables was truly amazing. 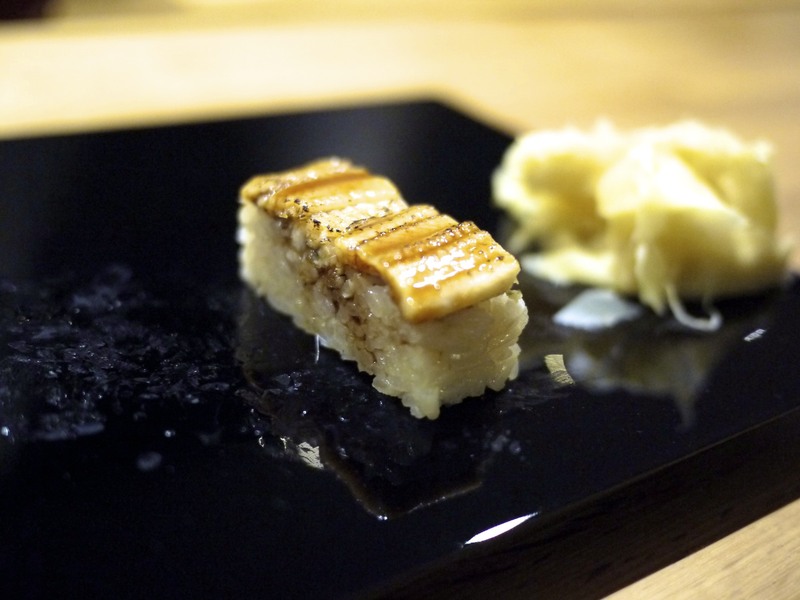 19th Course – Sweet Egg Cake / Tamagoyaki (卵焼き): This one was with a twist. 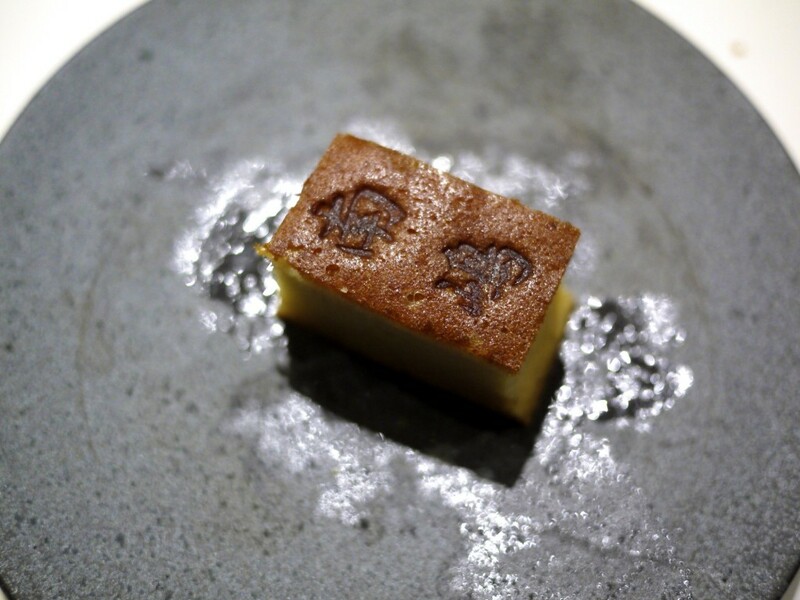 The tamagoyaki was made more like a castella-styled cake which the Portuguese brought to Japan in the 16th Century. 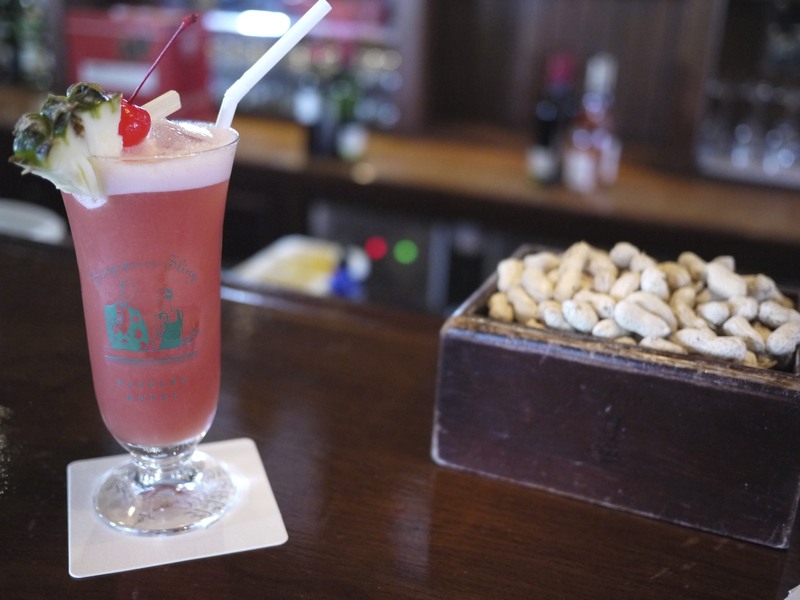 It had a lovely sweetness and moisture. 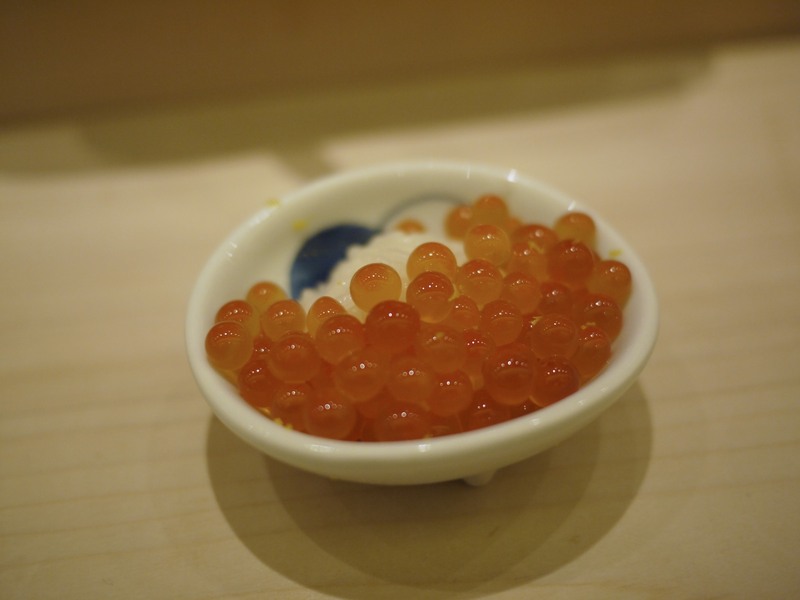 20th Course – Salmon Roe / Ikura (イクラ): In addition to re-ordering the flounder, sea perch and seared ootoro, I could not go away without asking for my childhood favourite of the salmon roe. 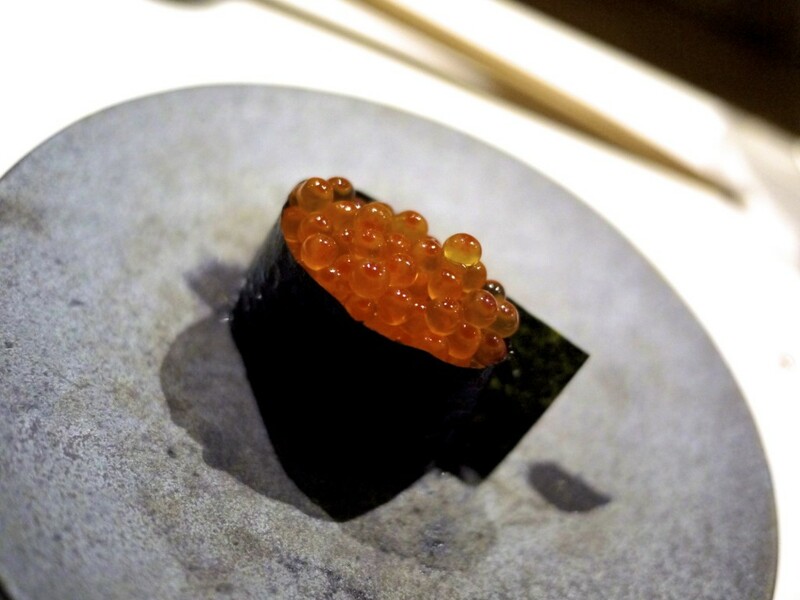 The salmon roe sourced from Tasmania was firm enough to be individually savoured but in my opinion, marinating the salmon roe in soy sauce would have elevated this dish further. 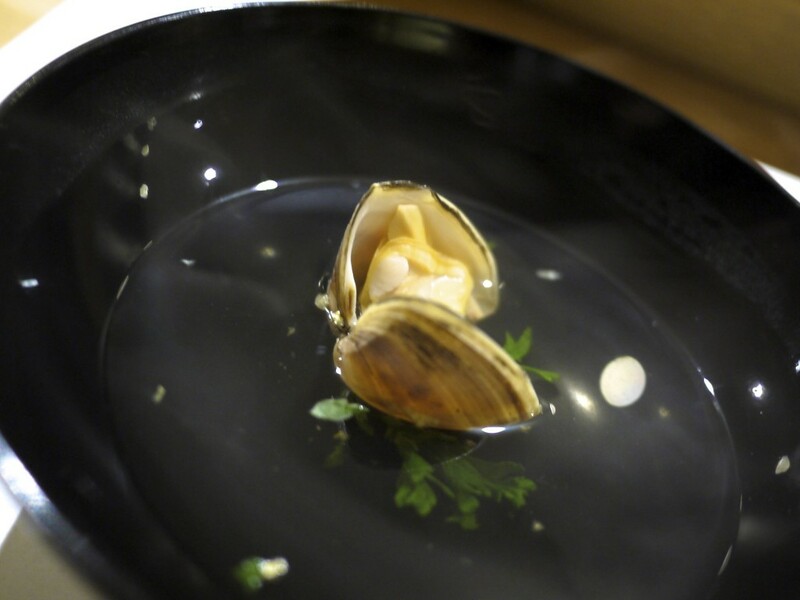 21st Course – Diamond Clam and dashi: A sweet and chewy clam suimono that washed away the lingering flavour of sushi before jumping on to the finale of the dessert. 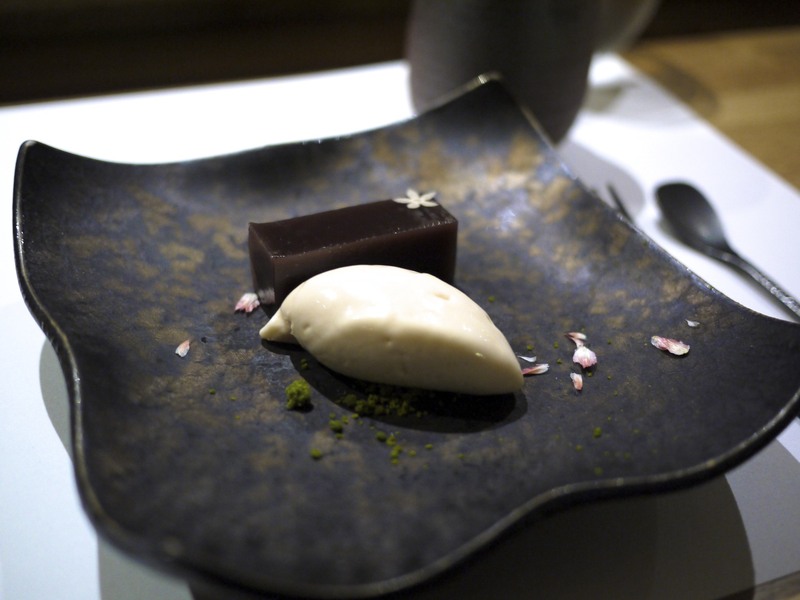 22nd Course – Yokan and Cherry Blossom ice cream: The yokan (red bean paste cake) was smooth and washed down ever so well with the hot tea. The cherry blossom ice cream left a floral aftertaste and the bitter matcha (green tea) contrasted ever so well to the sweet and rich yokan. 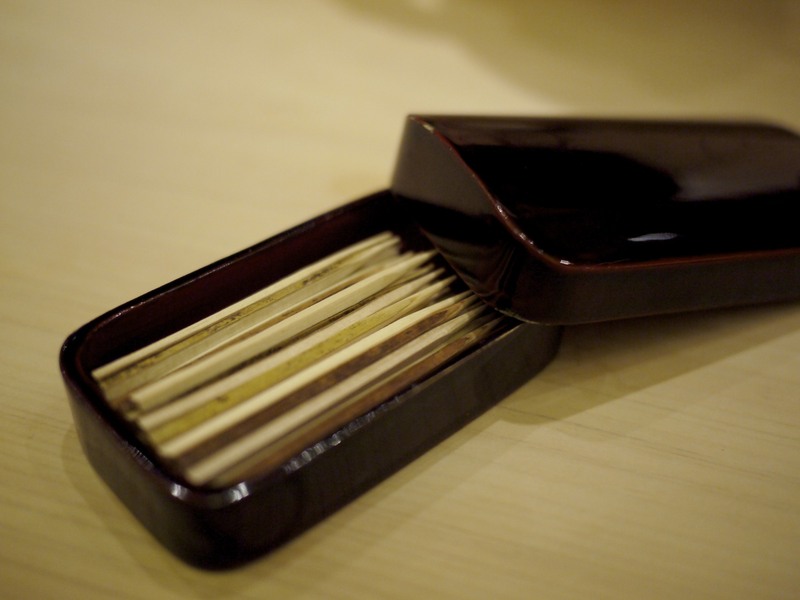 All in all Minamishima for me was a success despite a couple of missteps, the sinew of the ootoro for instance comes to mind. 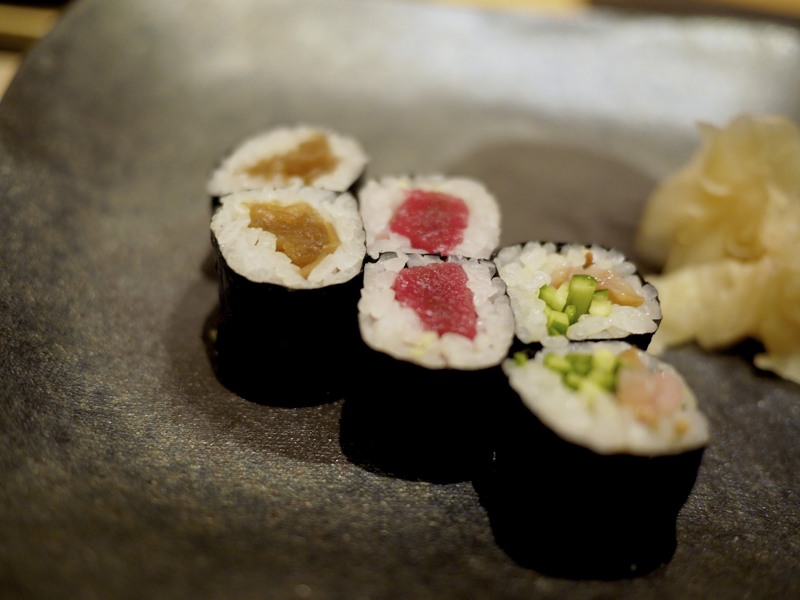 However, it shows a lot of promise and certainly exceed the level of sushi I’ve encountered in Melbourne, let alone Australia. 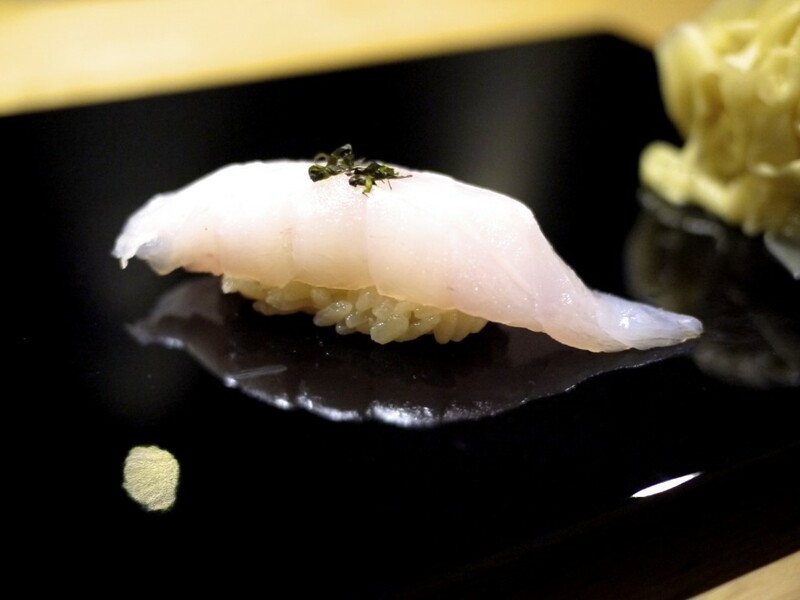 Sure, it wasn’t on par with Kanesaka in Singapore or Sushi Tetsu in London but it showed promise with great innovations like the flounder’s fin nigiri which literally just blew me away. 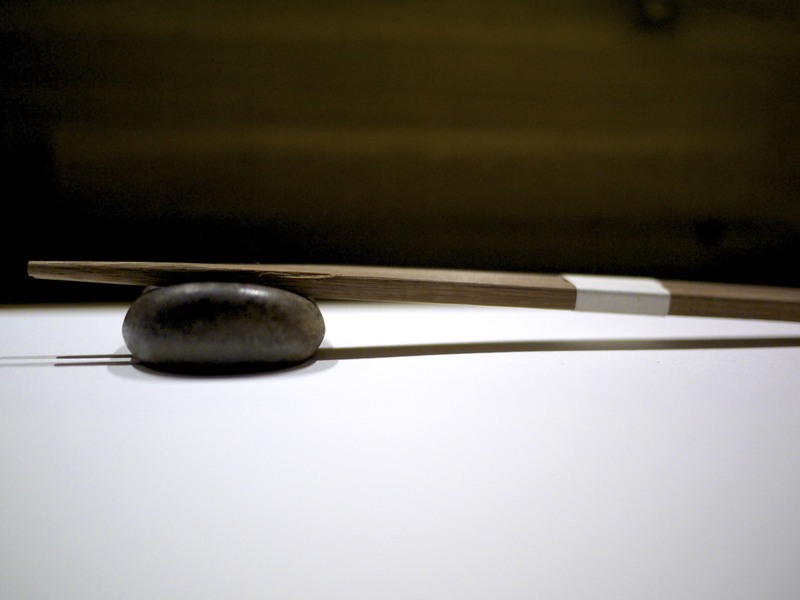 It would be interesting to see what creative dishes Chef Minamishima comes up with in the future. 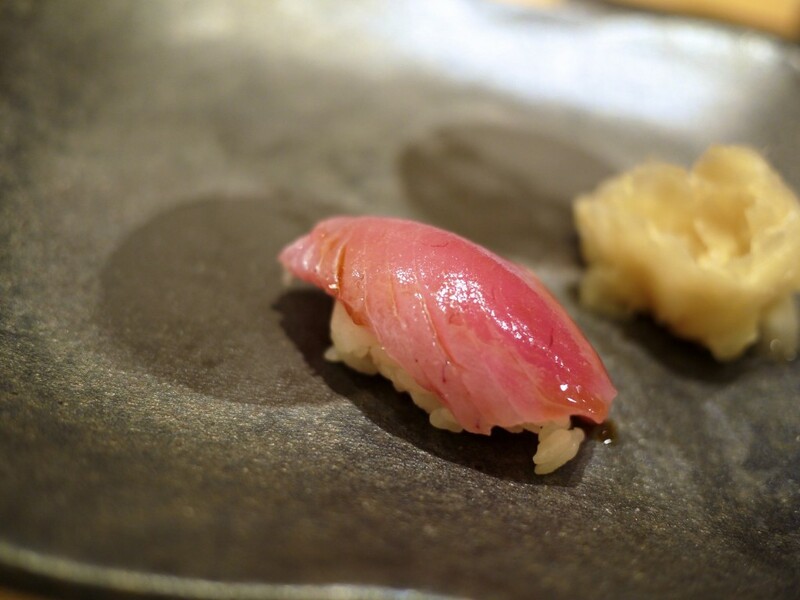 This entry was posted in Australia and tagged chuutoro, Edomae, Hajime Horiguchi, Koichi, Melbourne, Minamishima, ootoro, Richmond, salmon roe, sea perch, Sushi, uni on January 1, 2016 by admin.